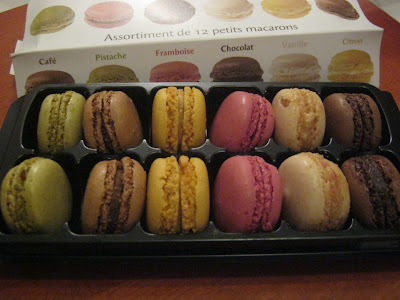 Agnes' Diary & More...: The Macarons has arrived!! I would like to say a big "thank you" to InspiredMom who recently organised a free giveaway contest at her blog. I am very overwhelmed to the fact that I was the winner in this contest. when I first saw the contest, I told myself that I want to have those Macarons and I followed through with what are the requirements to be a winner, and I did it!!! 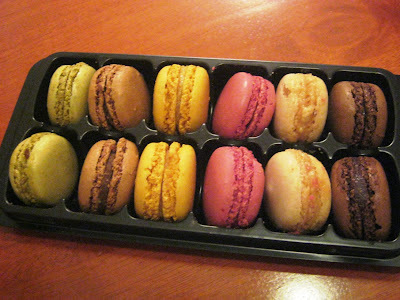 I have won a pack of 12 pieces petit Macarons in assortment of six flavours, that is Cafe, Pistache, Framboise, Chocolate, Vanilla, Citron. I received it this afternoon, just a day it was sent by courier, it was securely packed, I received this box of Macarons without damaged. Perfect!! I have heard and seen so much about Macarons in website advertisement, recipe and food websites, blogs and magazines, honestly speaking, I have never tried the Macarons before. For one they are consider luxurious treats and secondly, hardly find shops selling them in where I live. Blogging can be rewarding. I earn some extra money through sponsored posts and most importantly I earn friendships through blogging. Those look really yummy. Congrats for winning the competition! !